Divides a all faces in shell with given criteria Shell. Returns context with all the modifications made during last call(s) to Perform() recorded. Returns a message decsribing modification of a shape. Returns the tool for splitting faces. 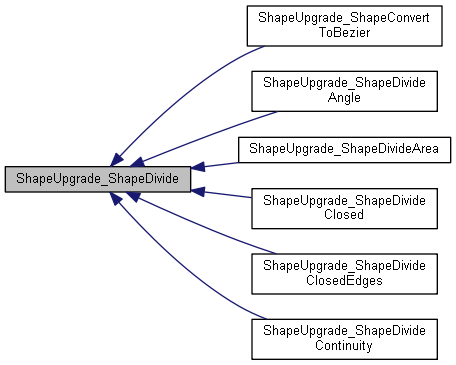 Reimplemented in ShapeUpgrade_ShapeConvertToBezier, ShapeUpgrade_ShapeDivideContinuity, and ShapeUpgrade_ShapeDivideArea. Performs splitting and computes the resulting shape If newContext is True (default), the internal context will be cleared at start, else previous substitutions will be acting. Gives the resulting Shape, or Null shape if not done. Sends a message to be attached to the shape. Calls corresponding message of message registrator. Sets mode for splitting 3d curves from edges. 0 - only curve 3d from free edges. 1 - only curve 3d from shared edges. 2 - all curve 3d. Defines the spatial precision used for splitting. Sets the tool for splitting faces. Purpose sets mode for trimming (segment) surface by wire UV bounds. Queries the status of last call to Perform OK : no splitting was done (or no call to Perform) DONE1: some edges were splitted DONE2: surface was splitted FAIL1: some errors occured.